If you are trying to watch your weight for bikini weather, this is a great dessert. I actually completely forgot about the recipe until my longtime friend Julie just asked for it. I can't take credit for this picture, and will post Julie's when she makes this dish next weekend. 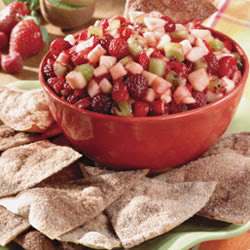 Recipe from allrecipes.com under "Annie's Fruit Salsa and Cinnamon Chips"